Coach Rich had a dream and it turned into The Baseball Barn. Rich learned to play baseball in east Texas and continued his passion for the game in the US Army in Germany with his little brother and continued that 1-2 combination in Washington D.C. and the east coast. He is still active in local baseball and Little League where he coaches and manages a Little League and an independent competitive baseball team. Coach Rich has learned from many good local baseball men and follows the preachings of a friend also named Rick in teaching a strong mindset and will. 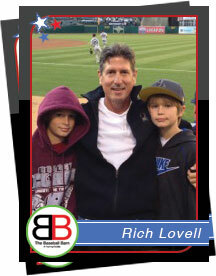 Coach Rich’s passion and experience shows in the way he approaches coaching and teaching baseball. Through study, hard work and some fortunate contacts he has made, he has become very knowledgeable on the MLB swing and teaches the MLB swing at The Barn through video analysis, proprietary and progression drills, and having fun. He is a certified hitting instructor through the Epstein Hitting System. Understanding that there is life after baseball, Rich encourages players to achieve on and off the field at home, school and in their community.